Huntington Woods, Michigan USA - 26 January 2019 - Opponents and supporters of Drag Queen Storytime at the Huntington Woods Public Library rallied outside the suburban Detroit library. A small group opposed the popular program, while two hundred local residents turned out to support it. 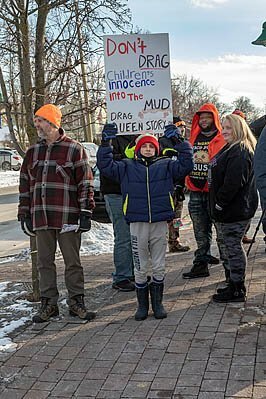 Image Description: Huntington Woods, Michigan USA - 26 January 2019 - Opponents and supporters of Drag Queen Storytime at the Huntington Woods Public Library rallied outside the suburban Detroit library. A small group opposed the popular program, while two hundred local residents turned out to support it.